In January 2018, Brazil introduced electronic visas for citizens of Australia, Japan, Canada and the United States. By applying online, travelers of the mentioned nationalities do not have to visit the consulate to apply for a tourist e-visa. This streamlined system cut out the time wasted waiting in lines and costly processes that were previously in place. 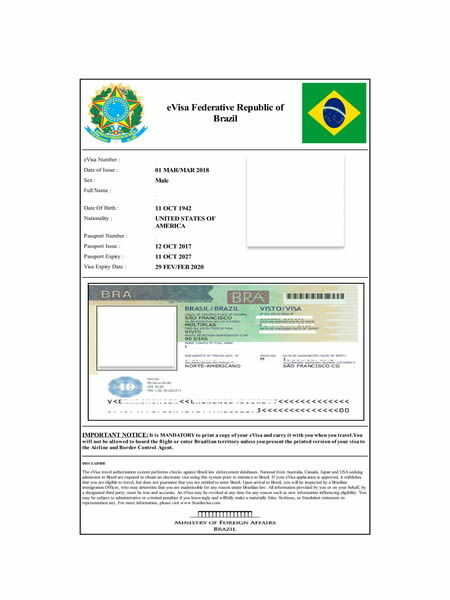 The Brazil Tourist e-Visa includes four categories of people: People traveling to Brazil on vacation, People who go to Brazil to visit their family or friends, Unpaid participants in athletic or artistic events and competitions and Unpaid participants in scientific/academic seminars or conferences sponsored by academic or research institutions. Applicants will receive their visas via email, after filling the application form with the necessary information and once the online payment by a credit card is completed. Upload a color scan of passport bio page of both parents. An authorization letter signed by both parents. An authorization letter for minors applying for a Brazilian visa. A justification letter that states why only one parent or one legal guardian is authorizing and not both along with bio page and photo. Currently only citizens of the following countries can apply for Brazil Tourist e-Visa: Australia, Canada, United States and Japan. Only regular passport holders are eligible to apply for Brazil Tourist e-Visa. All travelers need to have a valid passport for at least 1 month from the date of application. If your passport validity is less than 1 month, you will have to renew or apply for a new passport before applying for an e-Visa. Your stay in Brazil with e-Visa is limited to 90 days per year. You can apply for a Tourist e-Visa only if your intentions in Brazil is tourism. In the visa applications of children of Brazilian citizens who have not been registered as Brazilian, it is necessary to fill out and send the "non-citizenship declaration". The Brazilian Tourist e-Visa is an electronic travel visa which allows citizens of eligible countries to travel to and around Brazil for tourism. The electronic visa is valid for two (2) years and allows the holder to spend 90 days per year in Brazil. The tourism e-Visa for Brazil can be easily obtained by completing a simple online application. This means there is no need to visit an embassy or consulate to obtain travel authorization before visiting Brazil. Please note that after your application has been submitted to the Brazilian government, they may at times ask for additional documentation. How much does the Brazilian Tourist e-Visa cost? How long is the Brazilian Tourist e-Visa valid for? The Brazil Tourist e-Visa maintains its validity for 2 years or until your passport expires, whichever comes first. What conditions must the applicant’s passport meet for the Brazilian tourist e-Visa? What requirements should my e-Visa photo should meet? Can I apply for the Brazilian e-Visa while being in Brazil? No. The Brazilian tourist e-Visa must be obtained prior to your entry into Brazil. I lost my Brazil Tourist e-Visa. What can I do? No. All travelers, no matter the age, must have their own visa. While it is a common practice, this is not applicable to a Brazil e-Visa. How will I receive my Brazilian Tourist e-Visa? We will send you the Brazilian tourist e-Visa by e-mail. Once you receive it, you need to print it and show it while boarding your flight and at the immigration office when you arrive in Brazil. Our recommendation is to print multiple copies so that if you lose one, you have at least one spare. How long can I stay in Brazil with the Tourist e-Visa? Are there any additional requirements for an e-Visa application for my minor child? This can be a sensitive subject so please be advised, you need to have a few additional documents if you want a Brazil e-Visa for your minor child. You, as a guardian or parent, must upload additional documents when you apply. You need to prepare a copy of the passport page and photos of both parents, as well as an authorization letter signed by both parents. If you travel with your child alone (e.g. divorced,) you are required to upload an authorization form from the other parent. If the other parent is deceased, you need to have a death certificate. Last but not least, if you have the sole custody of your child, you need to have a legal custody document. The point is that you need to prove that you do not take the child out of the country without the other parent knowing. Is the Brazilian tourist e-Visa for multiple or single entry? How do I know if my Brazilian tourist e-Visa is still valid for travel to Brazil? If you have applied for a Brazilian tourist e-Visa, you can inquire through this site to find out its current status. You will need to log in in order to make this inquiry and renew your tourist e-Visa if it is necessary. If I already possess a valid tourist e-Visa, can I apply for a new Brazilian e-Visa again? A new tourist e-Visa cannot be obtained using the same passport until that actual e-Visa expires. If you lose the passport which contains the actual and valid e-Visa you may apply for a fresh tourist e-Visa by paying the relevant fee again. What should I do if my Brazilian tourist e-Visa application is not approved?